KENT Marine ProScraper's are ideal for cleaning scratched glass or acrylic. With rubberized handles and blade attachments from strong ABS plastic and stainless steel these units will not rust and resist breaking. The plastic blade will gently scrape off most naturally-occurring algae without scratching the glass or acrylic surface and steel blades will work on that hard coralline algae and calcified deposits. ProScraper II metal and plastic blades are interchangeable and replaceable. The Pro-Scraper is built with a floating handle to ease recovery of a dropped scraper. The Scraper unit comes with three different detachable blades to handle just about anything you can throw at it. The detachable blades can be replaced when they become broken or dull. 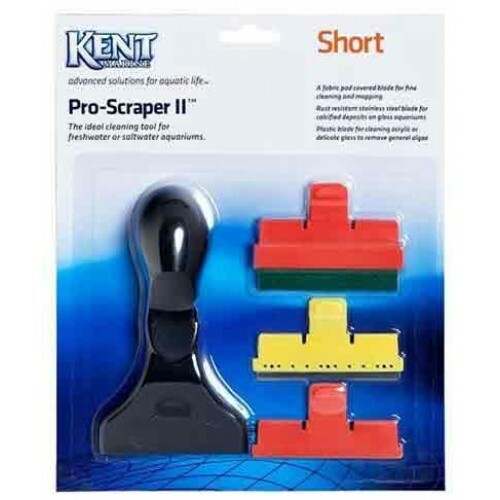 KENT Marine ProScraper's are by far one of the best choices for an aquarium scraper.